Premier League match preview. 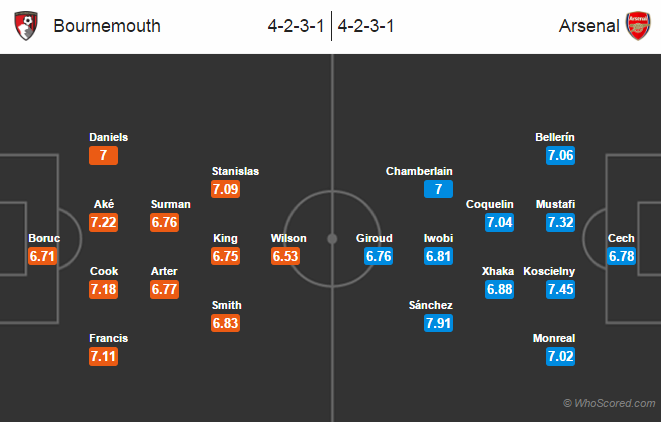 Possible Lineups, Team News, Stats – Bournemouth vs Arsenal. Referee: Michael Oliver, Stream Guide: Watch Live. Jack Wilshere will miss out because of his ineligibility to play against the parent side. Josh King likely to take his role. Marc Pugh and Lewis Cook are both out through injuries. Callum Wilson and Adam Smith are both eyeing for a start. Mohamed Elneny is on international duty ahead of the Africa Cup of Nations. Francis Coquelin is likely to replace him. Mesut Ozil and Theo Walcott are doubtful for this game. Chuba Akpom, Per Mertesacker and Danny Welbeck have returned but are still not fit for first team action. Trio Santi Cazorla, Mathieu Debuchy, Yaya Sanogo remain on the sideline through injury. Alex-Oxlade Chamberlain and Shkodran Mustafi are eyeing to start the game. Arsenal have won their last three game against Bournemouth in all campaign, scoring more than a goal in each of them. Both the sides have won two and lost two in their last four Premier League games. Arsenal are unbeaten in 26 of their 29 league games. Arsenal are on fourth spot, Bournemouth are on ninth in the Premier League table. The visitors to dominate the possession. Olivier Giroud on the scoresheet.